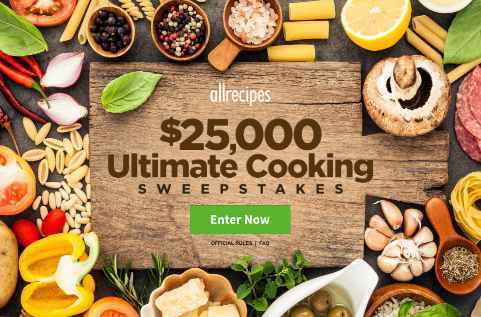 AllRecipes brings you the $25,000 Ultimate Cooking Sweepstakes where they will be giving away $25,000 cash prize in the form of check to one lucky winner. How To Enter The AllRecipes $25,000 Sweepstakes? During the sweepstakes period go to this link www.allrecipes.com/25ksummer. Enter this sweepstakes now through 11/2/18 for your chance to win $25,000 cash. There is not limit to enter this sweepstakes, each individual can receive unlimited entries throughout the Sweepstakes Period. When To Enter: The $25,000 Sweepstakes begins at 12:01 a.m. Central Time (“CT”) on 5/16/18 and ends at 11:59 p.m. CT on 11/2/18. Sponsor: Meredith Corporation, 1716 Locust St., Des Moines, Iowa. Sweepstakes Prize: The Grand Prize Winner will receive the following (the “Grand Prize”): Twenty Five Thousand Dollars ($25,000) presented in the form of a check. Approximate retail value (“ARV”) of the Grand Prize: $10,000.